The Regions Premium Visa Signature Credit Card currently has an Informr score of 4 out of 10. This score is based on our evaluation of 2 sources including reviews from users and the web's most trusted critics. 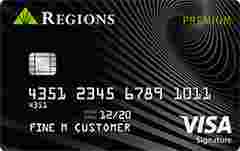 Regions Premium Visa Signature Credit Card is typically available to those with excellent credit scores (650 or greater). Earn 3 points on qualifying purchases madein the first 90 days after account opening. We’d say the Premium Visa Signature’s best trait is its low APR. If you carry a balance more often than not, the 12.99% interest rate will save you hundreds of dollars over the course of a year as compared to the Chase Freedom Unlimited. The biggest drawback to this card is its annual fee, which cuts into the overall value even when you take into account the 3% rewards bonus the first 90 days and the permanent 1.5% rewards rate.